Ours is the only guided visit that covers both levels of the iconic Uffizi Gallery, giving you the best view of art’s greatest masterpieces. As featured in a BBC World documentary with Michael Palin, it offers easy access to the world-famous art museum. 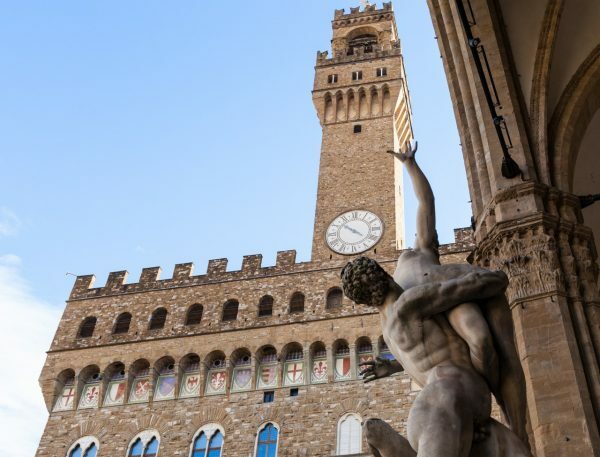 Our Uffizi tour will introduce you to the famous artists of Italian history. Or, at least, their works. Leonardo. Michelangelo. Titian. Raphael. Caravaggio. Their names carry so much of Italian art history. But it’s not until you stand before their art that you appreciate their genius. After all, it’s like they say: seeing is believing. Our Uffizi tour covers the Uffizi Gallery’s major rooms and halls. Not only that, but we’re the only company in Italy recommended by just about every major travel guide. 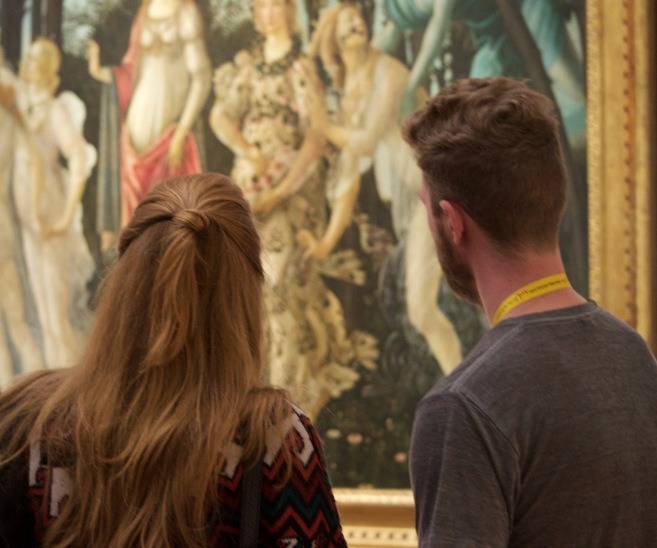 This means a streamlined Uffizi tour that helps you focus on the most important artworks. 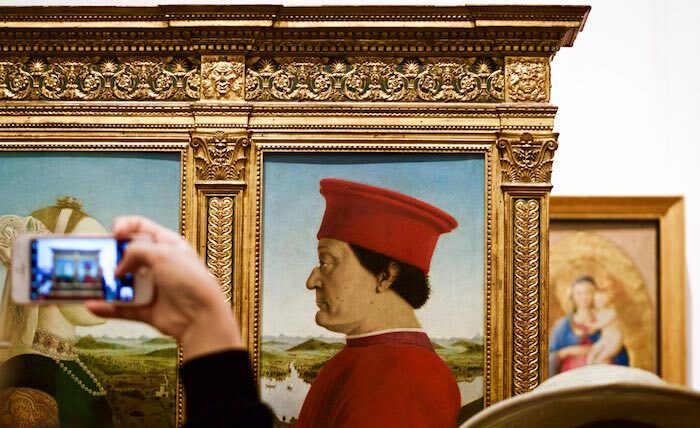 We know how overwhelming museums can sometimes be, and that’s why we carefully curate our Uffizi tour. Find out how Michelangelo out-smarted a famous skinflint. 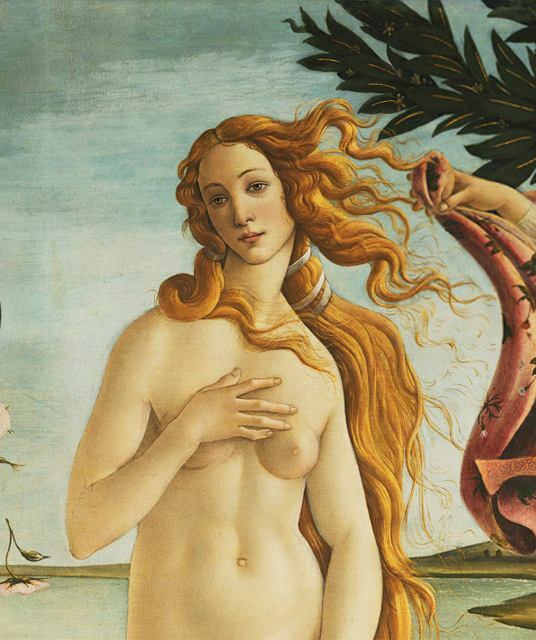 Learn about the mysterious and beautiful model in Botticelli’s Birth of Venus. See the transformation of Leonardo da Vinci’s creative talent. 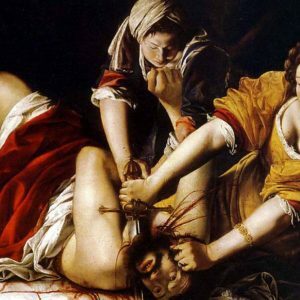 Understand the major techniques used in Renaissance art. But we don’t just tell you the history of a piece of art: we show you that history. Our expert guides will show you the beauty and value of countless art masterpieces. And best of all, we’ll make it entertaining too. Blame it on our background as a theater company, but we believe tours should be entertaining. Avoid long lines with skip-the-line tickets and take the shorter, quicker line. Take the quickest entry and get up close and personal with the Renaissance masters! The Masterpieces of the Uffizi Gallery-Prefer a Private Uffizi Tour? You can choose to do the Masterpieces of the Uffizi Gallery as a private or small shared group experience. All persons under 17 must present valid ID showing date of birth for entry into museums or full adult price will be charged. 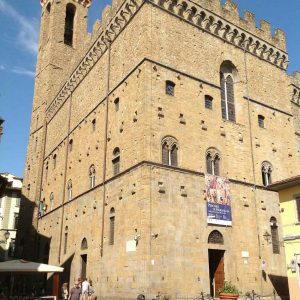 Included in price: Uffizi Museum skip-the-line entry and reservation fees, small group guarantee, professional guide, audio headsets used when required. Time: The small group tour runs from Tuesday to Sunday from 13:30-16:00. This tour does not run on Sundays from the first of march until Easter nor on Sundays in November. Museum security: Due to increased security, some delays are to be expected. We do in any case offer the quickest possibly entry. Backpacks, large bags, liquids, ‘selfie-sticks’ and long umbrellas are not permitted in the museum. It is not always possible to check them in so please carry as little as possible. Can this tour be combined with other tours? 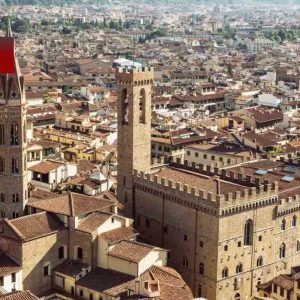 Yes, you can combine this tour with the Original Florence Walk and the David tour to cover all the highlights of Florence, but we recommend spreading the tours over at least 2 days. Are children allowed on the tour? Yes, children of all ages are allowed on the tour. Does skip-the-line mean we don’t have to wait? You won’t have to wait in line with the rest of the visitors that do not have a reservation, there is a separate entrance for people who have skip-the-line reservation but you still have to go through security check and there might be a line for that. Can the tour be done with physical disabilities and/or wheelchair? Yes, there is a ramp and an elevator in the Uffizi gallery. Is the tour also available in different languages? The shared group tour runs in English only, but we can arrange private tours in other languages. I had a really interesting and fun tour of the Uffizi gallery in Florence with a company called Artviva. We were escorted to the gallery by a young guide who is a native speaker of English and were able to gain entry without the usual interminable wait in the queue. Our guide on the Uffizi tour was probably the best guide on any tour I have ever attended, lively, fun, informative. A great afternoon. Booked small group tour for Friday 01st March at 13.30. Meeting point changed, but when we phoned to query they answered phone immediately and the tour guide came to us. It was only the two of us on the tour so we were spoilt. No queue to get in, quickly through security and into the gallery. Pier Carlo Testa our guide was an English lady who was a wealth of information. She made the tour very interesting with little snipets of information bringing the paintings to life. On the 1st Sunday of each month entrance to the galleries is free, which may account for why it was quiet on the Friday. When we walked past the gallery on Sunday the queue was horrendous, it was like the queue for day tickets at Wimbledon tennis. Klaus was an extremely knowledgeable and engaging tour guide, who provided deep context and a lot of historical knowledge in a friendly and fun manner. He was fantastic and the tour was great! A wonderful tour of the Uffizi from the Medieval period to the height of the Renaissance to the Baroque era. All recounted by our wonderful guide Klaas who was so generous with his knowledge and time! We zigzagged the galleries with him going from one masterpiece to the next. A great afternoon thanks to Klaas’ interactive style and his sunny disposition. Thank you ArtViva for your amazing team of staff (Faeza et al) and guides! Loved our guide Helga. Her knowledge and enthusiasm were the best part of the guided tour of the Uffizi. We enjoyed an excellent tour with Angelo. He is fantastic, very competent and explained expertly and entertaining. Highly Recommended. I was so excited to tour the Uffizi, but was worried it might be overwhelming. Without our guide, Catherine, that may have been the case. So if you want to see the best of the best, with a great guide, take this tour. Catherine’s deep knowledge and passion for the art was immediately evident. And yet she was able to convey and illuminate the paintings in everyday and easy to understand terms. 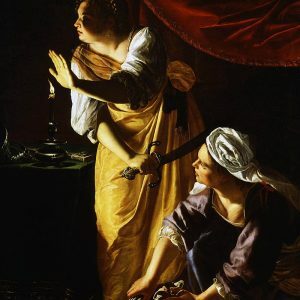 She added personal stories about the paintings, artists, and the people, which I particularly liked, as it helped me to imagine what it was like back then. Overall, this is a great tour which you should seriously consider taking! We were a group of 3 people. I booked the tour from the United States with no problems. The tour was Fantastic! Brenda was our guide and she was great – could not have been better! She has a lot of Art History knowledge. She answered many questions and had great stories about the artist, Florence and history in general. I highly recommend this tour! Martina gave life to the Uffizi gallery. Hard to believe such a young person could have so much knowledge. Her love of the art pieces and their history was easy to see and enjoy. Fantastic tour! This was a great tour of the art highlights in this gallery! Our guide was very knowledgeable. We are really not art enthusiasts, but this tour was just enough historical information to suit us. If we hadn’t done the tour, we wouldn’t have understood the significance of the paintings. We have booked the tour based on the reviews and it did not disappoint! Our tour guide was Sally. We found her to be extremely knowledgeable in Art History and Renaissance specifically. She was so captivating that the time just flew by and the tour was over. I have already recommended Art Viva and Sally to my friends who are planning on traveling to Italy. Book your tour! You will not be disappointed!